River Empress continues Uniworld's long standing tradition of being one of the very best river cruises in the world. Offering all sorts of itineraries up and down the Danube River, it will be tough to find a River Empress cruise that you won't enjoy! Featured itineraries include Europen Holiday Markets, Grand Christmas & New Year's Cruise, Tulips & Windmills, and European Jewels. 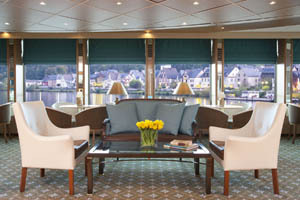 All voyages feature the same great service and staff that have many Uniworld famous all over for river cruising. River Empress prides itself in being an expert for the central Europe region. This expertise extends to both land tours and culinary delights. Every stop along the river, and there are a lot of them, features a local expert guide who will take you exactly where you need to go to see the highlights of every town and city along the way. After working up quite an appetite on your tour, come back to River Empress to continue your local experience with lavish 4-course meals that feature some of the finest and freshest local ingredients incorporated into amazing local dishes. 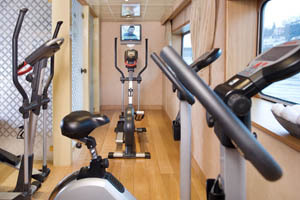 Besides exciting stuff to do on shore, River Empress also has entertainment options onboard. Some features are a full-service bar, library stocked with some of the best books on local knowledge and history, sun-deck with life-size chess and shuffleboard, and a fitness center. Throughout your cruise enjoy music and dance as local performers come on your boat to entertain you at night. The immersion never ends! All river cruises aboard River Empress feature some of the most exciting shore excursions to be found in Europe. Each itinerary features multiple ports of call at quaint European towns that define the romance of old-world Europe. Guided or nu-guided tours, the choice is yours. Trek out on your own or fall in line with a guided tour by local experts. 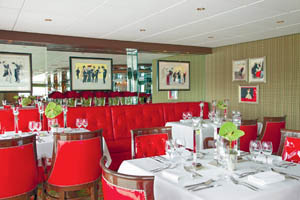 A main highlight of sailing on River Empress is the culinary experience. Taking all the best flavors and dishes of every single stop along the way, there will be no shortage of excitement for your culinary appetite. Expertly trained staff offer many dishes every night for passengers to choose from as well as wonderful wine suggestions that highlight the local aromas of small town France. 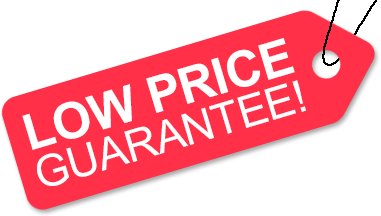 Low Price Guarantee on all River Empress Cruises! Book any River Empress river cruise with us and you'll get the best deal possible, regardless of the ship or sail date! Because of our "Low Price Guarantee," nobody beats our River Empress cruise prices, so look around and you're sure to find the best River Empress cruise deal possible when booking with us! We do not charge booking fees on any cruises! You're sure to enjoy an affordable River Empress cruise when booking with us! Our special offers on River Empress cruises may not be combinable. Click a price below to view the River Empress cruises during that month in that destination. 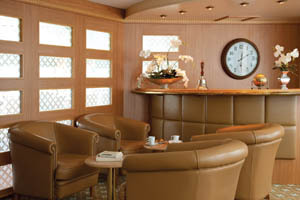 There are 4 Suite staterooms on board River Empress. This accommodation has a French balcony and can fit up to 2 guests. The Suite includes all amenities listed above, plus a bottle of wine upon arrival, laundry service. shoe shine, daily fruit and cookie plates, morning coffee, daily newspaper. There are 23 Category 1 stateroom on board River Empress. These accommodations can fit up to 2 guests. Category 1 cabins Include all amenities listed above. There are 26 Category 2 stateroom on board River Empress. These accommodations can fit up to 2 guests. Category 2 cabins Include all amenities listed above. There are 6 Category 3 stateroom on board River Empress. These accommodations can fit up to 2 guests. Category 3 cabins Include all amenities listed above. There are 4 Category 4 stateroom on board River Empress. These accommodations can fit up to 2 guests. Category 4 cabins Include all amenities listed above. There are 4 Category 5 stateroom on board River Empress. These accommodations can fit up to 2 guests. Category 4 cabins Include all amenities listed above. The deck plans of River Empress provided on this page are subject to change. We reserve the right to correct errors. Please verify all information with Uniworld directly.